Watch my 5-minute TED talk to see how the American Idol model is empowering women and minorities, introducing the concept of meritocracy, and uniting across ethnic and tribal divides by reviving local culture in Afghanistan and the Arab World. Culture is more important than ever, but only the extremists seem to get it. That is why totalitarians from Daesh to Hitler to the occupiers of Timbuktu attack and try to destroy culture. Extremists get why Culture Matters; why don’t we? The Timbuktu Renaissance(TR), a Malian-American project to support Timbuktu’s (and Mali’s) recovery from conflict through a focus on her culture, of which Cynthia is a Co-Director, is pleased to announce that it has received a grant from the National Endowment for Democracy National Endowment for Democracy(NED) that will enable the TR to open a Center for Innovation and Culture in Timbuktu. The Center will be a gathering place for the people of Timbuktu, especially youth, and will be outfitted with computers, donated by the Google Cultural Institute (GCI). Trainings, conferences, and “rencontres” between the youth and leaders from various sectors of society, such as the Imam of Djinguereber Mosque, the Mayor, the Head of the Committee on Crisis, etc. Relationships with various partners who will hold their programs at the Center will leverage its potential as a gathering place. The main programming activity will be concerts of Malian music, curated by Timbuktu Renaissance co-director Manny Ansar, founder of the renowned Festival Au Désert. Some of the concerts will feature exclusively musicians from Timbuktu, while others will include artists from Bamako or other major Malian cities. By providing an enjoyable activity – one that was very much part of the life of Timbuktu before the crisis of 2012 –we hope the concerts will increase social cohesion among the citizens of Timbuktu, and will rebuild trust between people of different ages and backgrounds. Cynthia traveled to Mali in January-February 2017 with the goal of attending the return of the Festival au Désert in Timbuktu, but sadly the event was cancelled due to lingering insecurity. Still, Bamako was alive with music, with both the Acoustik Festival, founded by Toumani Diabaté, and the Festival du Dogon (Dogon country Festival) drawing crowds. The Minister of Culture N’Diaye Ramatoulaye Diallo (“Rama”) held a well-attended press conference to announce the Timbuktu Renaissance’s progress, specifically the opening of the Center. Cynthia and Manny Ansar announced other projects in the works by the Timbuktu Renaissance. The TR is supporting a pilot study on selling Timbuktu’s artisanal goods via online sites. The Timbuktu artisans desperately need financial support, or else, with no tourists, their craft traditions will die. 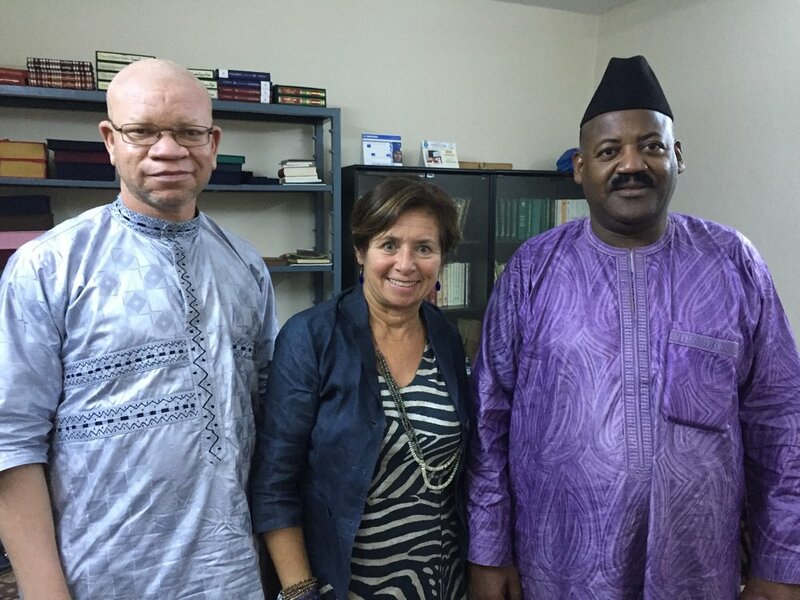 In addition, the TR has plans to open a music recording studio – the first one north of Ségou. The Laboratory for Global Performance and Politics, the inter-disciplinary project Cynthia co-directs with the goal of ‘humanizing global politics through the power of performance’ recently celebrated World Theatre Day with Dreams Deferred: Crossing Continents and Cultures with A Raisin in the Sun, an event that brought together theater makers from South Africa, Sweden, and Washington DC all inspired by Lorraine Hansberry’s story of a struggling African American family. The performances and discussion illuminated how the play written in 1959 about a family on Chicago’s south side resonated in post-apartheid South Africa, in a contemporary Sweden struggling with the challenges of immigration, and in today’s America. Think of it: the words and the story created in 1959 by twenty-nine year old Lorraine Hansberry—herself a pioneer and symbol of resistance as the first black woman to have a play produced on Broadway-- sound intimately familiar to people in South Africa and Sweden today. The entire evening was a testament to the power of arts and culture to connect across borders; you can watch it here. The Lab is also very pleased to announce our first class of Fellows, ten emerging leaders from around the globe, working at the intersection of politics and performance. Please read about them here. For more information on the Lab, please see under “Projects”. Cynthia was the 2016 Australian American Leadership Dialogue (AALD) Fellow. From May 8-14, she crisscrossed Australia, stopping in Melbourne, Canberra, Perth, and Sydney, speaking about soft/smart power and advocating for the importance of culture in 21st century diplomacy. Cynthia also participated in a roundtable forum: “Soft Power and Public Diplomacy in the Indo-Pacific Region," co-organized by Griffith and Bond Universities in Brisbane. In July 2016 returned to Melbourne to attend Psi 22 “Performance Climates”, a global conference hosted by Performance Studies International. Cynthia and her Laboratory for Global Performance and Politics Co-Director Derek Goldman performed research for the Lab’s OUR OWN EARTH performance and research project on climate change and environmental justice. In February-March 2017 Cynthia attended the AsiaTOPA Festival as a guest of the Arts Centre in Melbourne, and Festival organizers Stephen Armstrong and Kate Ben-Tovim. She delivered a keynote speech at the “Water Futures” conference, organized by Arts House and Tipping Point, and spoke at the Wheeler Centre about the US elections “USA Today”, as part of their Fifth Estate program.